Candice Berman Gallery was established in 2013 as a contemporary art space showcasing artists of emerging, mid-career and established calibre. This year they will present the work of Kimberley Gundle at the FNB JoburgArtFair 2016, with a simultaneous exhibition of the artist’s work running at the gallery space in Johannesburg. 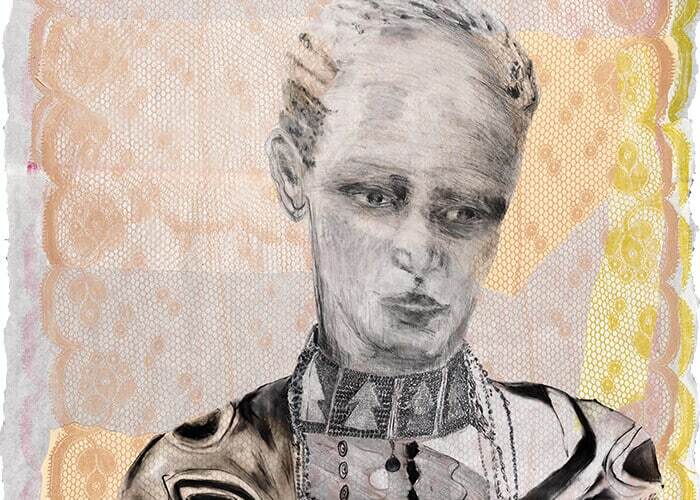 Kimberely Gundle, detail of Nraposho, 2012. Mixed Media on Mylar on collaged screen printed, handmade Japanese and Nepalese paper 125 x 83 cm. All images courtesy of the artist and Candice Berman Gallery. ART AFRICA: Please tell us about the body of work produced for the FNB JoburgArtFair 2016? Kimberley Gundle: My work contains a series of portraits inspired by the Maasai tribe of East Africa. My artistic lens focuses specifically on the Maasai women. These bold and dignified women, swathed in brightly coloured cloth and adorned in ornate beadwork captivate me. I first came into contact with the Maasai in 2009, and I have since returned many times to draw and photograph Maasai communities. The portraits therefore are all based on individual women whom I have met, and whose character I have got to know. I will be exhibiting between five and seven large, limited edition archival prints, with seven prints in each edition. The original mixed media drawings of the prints were included in the Venice Biennale 2013, and will be showcased as a collateral exhibition, to coincide with the FNB Johannesburg Art Fair at Candice Berman Fine Art. Kimberely Gundle, detail of Sompol, 2013. Mixed Media on Mylar on collaged screen printed, handmade Japanese and Nepalese paper 134 x 90 cm. Image courtesy of the artist and Candice Berman Gallery. You’ve produced work in a variety of mediums, from traditional painting to making bespoke rugs and chairs. What defines your choice of medium? I am energised, excited and challenged when exploring various different mediums, with an open eye as to their unique potential. I find that oil painting on canvas and on board can be freer and develop a different kind of energy than when working on paper. By contrast, paper can be torn, collaged and repositioned, enabling textural layers. Clay provides physical, tactile involvement with the medium, brought further to life with rich glazing techniques. The nature of the rug invites me to create large abstract ‘paintings’ on the floor. Each rug is designed and hand knotted specifically for the space in which it will sit, and focuses on colour, energy and shape. When I was given the frame of a chair as my canvas, to be auctioned for the charity Chiva Africa, I was led into fabric design, and have since designed a series of silk chiffon scarves inspired by the Maasai, enjoying the flowing transience of the outcome. Much of your portrait work begins at an observational level, and is followed up by interviews and preliminary drawings, yet the final product often involves a fair amount of abstraction. Please could you walk us through your process? How do you arrive at the final image? Kimberley Gundle, detail of Kisinyinye, 2016. Mixed media on Mylar on collaged screen printed, handmade Japanese and Nepalese paper. With regards to my current work, my initial studies, sketches and photographs are done on location, during which a relationship begins to form between myself, as artist, and the subject. I then return to my studio, in London, where I work on larger pieces, drawing on insights from these original materials. I want to immerse the viewer in my perception of the beauty and fragility of the Maasai, built up through the mixed media of the work. 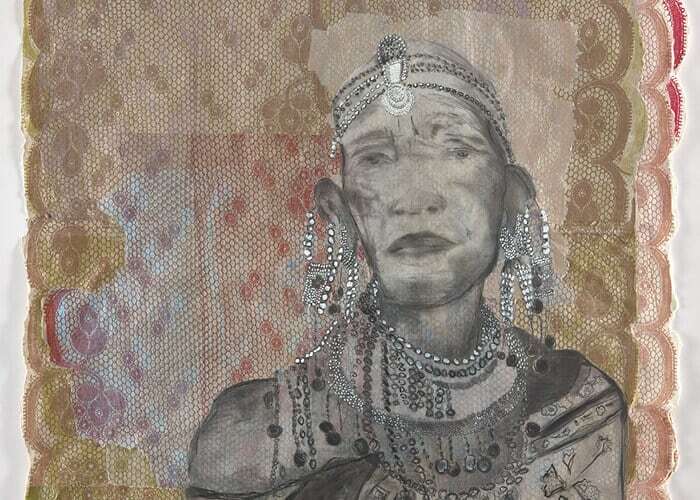 The background for each portrait is composed using a collaged assembly of overlaid fragments of hand made, and very finely textured, Japanese and Nepalese papers. Onto these layers I have screen-printed a repeat pattern taken from a small piece of my grandmother’s lace. The lace for me is symbolic of decoration, beauty, fragility and femininity. 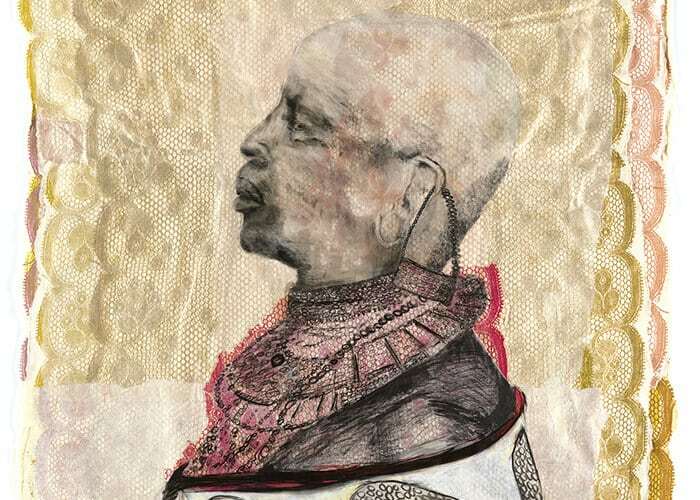 I overlay Mylar, drawing the portraits of the Maasai women in pencil, acrylic, pastel and inks, working on both sides of the translucent material. Thus the lace image knits with the portrait, through the fine layering. In this way the sense of abstraction builds up both an emotional and physical geography of the subject. The prints, exhibited at the Joburg Art Fair, although composed of a single layer, capture the depth and fragility so tenderly constructed in my original drawings. In 2015 you exhibited a body of work entitled ‘A Reflection on Preservation’ at Palazzo Bembo during the Venice Biennale 2015. This work was inspired by the Maasai following a trip to the Great Rift Valley in 2009, and aimed to ‘shelter a culture and tradition from the encroaching fangs of modernisation that threaten its erosion.’ What role do you believe your work plays in challenging issues of cultural appropriation in a gallery environment? This particular body of work focused, as you have said, on reflection and preservation, which I sought to capture through the presentation of my portraits as traditional cameos. It was the cameo form itself that I used to attempt to ‘shelter’ the culture from modernism. Cameos are oval-shaped portraits traditionally depicting royalty, and could be presented within a locket, handed down through generations. The oval shaped portrait makes each work feel small and loved, a keepsake. I wanted each portrait to feel special and preserved within this cameo; likened to a loved one, worn close to the skin, kept warm, shielded and protected. Sheltered in this structural sense, my work provides a platform for audience reflection. I do not use or take Maasai materials for my work, rather create my own mixed media portraits. It is for this reason that my grandmother’s Victorian lace or the form of the locket and cameo work their way into these pieces, through personal associations with these cherished heirlooms. In this way I seek to move away from appropriation towards a celebration of a longstanding culture and tradition of a subject I have grown to admire, be captivated by and devoted to. Finally, what role do you believe events such as the FNB JoburgArtFair play in creating a platform for artistic practice, both locally and abroad? Art Fairs provide a platform for galleries to introduce their chosen artists to the public. The FNB Joburg Art Fair focuses on local and international galleries, especially those with a link to African contemporary art, which makes it different from other international Art Fairs. Fairs attract local and international buyers to view and purchase a wide variety of artwork displayed under one roof. However, by contrast to the unique space of a gallery, exhibiting at an art fair can feel like a contrived environment in which galleries struggle to individualise, and emphasis is placed on sales as opposed to viewer experience. That said, fairs such as this bring together curators, artists and collectors who are all working towards creating a vibrant launchpad for contemporary art. Moreover, most Art fairs have talk programmes and collateral events which surround the fair to form a lively hub of creative activity.